The name "Blackburn Leisure" is associated with British Aerospace [BAE Systems] formerly Blackburn Aircraft, the factory is sited towards the river in Brough. Within the leisure club, various sections were created of different interests by the members which were mainly the factory staff. The roots to the society go back several years to the 1980's where a few interested people gathered together and took their own telescope for an evening of viewing - generally they meet at the top of the hill in Sancton. The Astronomy section ran with a steady few members using their own equipment . 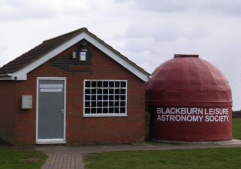 During the summer of 2000, the club was kindly donated a 12 inch telescope, and at that point it was decided that a permanent observing site was needed. Blackburn leisure was approached to see if we could use the old model steam railway building sited at the bottom of the playing fields, they granted us permission to use it and allow it to modified to accommodate a dome. It was soon realised that the equipment needed to be upgraded to allow more flexible and rewarding viewing for club members and general public alike. A grant application was submitted in 2005 to the Lottery "Awards for all" regional branch, with a successful award in May. This allowed a large computerised telescope and accessories to be purchased. So we purchase a 14" mead - self aligning go to telescope and after some modifications to the pillar support we were soon up and running taking pictures of the deep sky objects. Computer equipment within the main building is used to control the telescope with cameras to provide live images directly from the telescope in the comfort of the building. Soon local groups where being invited, such as the Hessle Cub scout pack in January 2004. Along with the Brough Cub scout pack in Mar 2004. The locals were invited to join in the latest event -- the transit of the Venus on 8th June 2004. Another grant application was submitted in 2010 to "Grass Roots" this also was successful mid year. This allowed us to be able to observe the sun by granting us to purchase an excellent hydrogen alpha filter and a suitable small 4 inch refactor telescope along with a sensitive camera with suitable solar filters to enable us to look at the sun with it's prominence's and sun spots. Since then the team at Brough have achieved some very good images. - see the photo gallery.